In the ’60s and ’70s, Williams Lake and Lake Artesia became weekend hotspots for teens looking to put on their shagging shoes and let loose. In the beginning, there was Williams Lake. 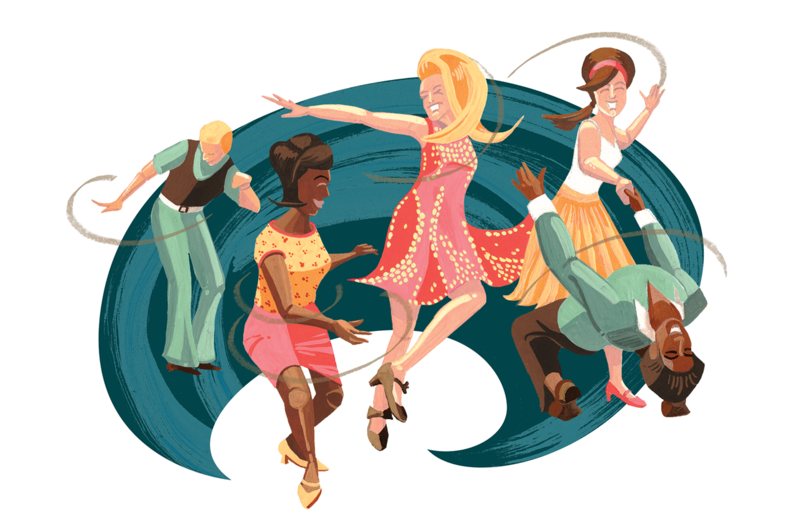 It was, as they say, before my time, though the national acts that played there — Mary Wells, Eddie Floyd, Jackie Wilson, and the host of bands associated with what would become known as “beach music” — kept teenagers dancing until 1970, when I was 11 years old. Because I was precocious in one way only and that was in the pursuit of things I ought not be pursuing, like dance halls in the middle of the nowhere, I nearly made it. I certainly did hear about it. Williams Lake was located near Mingo Township, in the northeastern corner of Sampson County, closer to Newton Grove and Dunn than it was to Clinton, where I grew up. The club had been drawing teenagers from all over eastern North Carolina since the 1930s, when a pavilion was built on the lake and the swimmers asked the owner, Clayton Williams, to put in a jukebox for jitterbugging. After a hard day in the tobacco and produce fields, which were the primary summer jobs for teenagers back then, a night at Williams Lake was a just reward. But its heyday was in the ’60s, when the shoulders of the country roads leading to the lake were clogged with the cars of kids looking to shag to the music of The Tams, The Drifters, and Maurice Williams and The Zodiacs. On a summer Saturday night, the club (officially called The Williams Lake Dance Club but known only as Williams Lake) was likely to draw from 600 to 700 patrons. Older kids would talk about it in that half hour between Sunday school and church, during which most of us congregated, for some reason, at the Clinton bus station. The stories I heard about Williams Lake were akin to the ones I would, in five or six years, be telling about “the other lake,” a dance club just across the Duplin line in Sampson called Lake Artesia. It was wild. The band was jamming. “I danced with a cute girl from Dunn,” the older kids would say about Williams; “I met this sweet girl from Goldsboro,” we younger kids would say about Artesia. The Williams Lake experience became even more legendary after the place closed. Its memory is kept most fervently alive by shaggers, whose devotion to that dance born out of our region, and the beach music associated with it, is undying. Bumper stickers exist urging you to “Remember Williams Lake.” Its legacy has even spawned a novel by the writer Bob Boan called Williams Lake was Once the Center of the Universe. Boan, who says on his website that he “goes shaggin’ whenever he gets the chance,” is also the coauthor of An Introduction to Planetary Defense: A Study of Modern Warfare Applied to Extra-Terrestrial Invasion. I mention this only because the farmers who lived within the vicinity of Williams Lake likely felt as if every weekend brought an alien invasion to their otherwise quiet country lanes. It seems highly probable that one or two of these aliens had to knock on the door of a farmhouse asking for a tow from a tractor to get his spaceship out of a ditch. No cars risked ditches or disturbed weekend peace at Lake Artesia. The club itself — an A-frame flanked by two wide wings that resembled, inside and out, a rustic lodge — was a good ways off the highway, down a sandy lane dead-ending in a huge field converted into a parking lot. A booth was set up at the highway. They charged by the head. This is why my memories of Lake Artesia — or Lake Amnesia, as it was commonly referred to for reasons that I shall leave to the imagination — are primarily associated with two things. The first is a brief but uncomfortable fetal curl in a car trunk that smelled of exhaust fumes and sounded of cooler slosh. The second is the clumsy crash through a sunken patch of piney scrub surrounding the lake — dense, buggy, and barely lit in the last rays of summer evening sun. As soon as my good friend and college roommate, Ricky Pope, got his driver’s license, he purchased a VW bus that impressed us all, especially given the times — the mid-’70s — when VW buses were ultra cool. But, of course, the bus was deeply flawed in that it lacked a trunk. I shared a Gran Torino station wagon with my siblings, equally ill-suited for trips to Amnesia. Driving a trunk-less vehicle left only the more onerous option of sneaking in through the woods. Having watched many a movie in which kidnap victims suffer in the cramped quarters of car trunks, it might seem strange that we preferred to cheat the owners out of a couple of bucks by stopping along the side of the road a quarter mile from the entrance and climbing quickly into the darkness. But security guards patrolled the perimeter of the parking lot, on the lookout for foolish kids stumbling, briar-scratched and mosquito-bit, out of the woods, and I would far rather fold myself upside a smelly spare tire for a few minutes than spend 20 worrying about stepping on a copperhead. I confess we did not come for the shaggin’ — none of us were much on the dance floor — though, as a lover of soul music and R&B in all its variations, I did love the music. We came to do the things teenagers did, and perhaps still do, in fields without adult supervision. And we came to meet girls from other small towns around Clinton. In hindsight, I wish I had spent more time inside the club, listening to the music, even learning to shag. During the three or four summers I spent going there, the bigger-name bands — The Tams, The Drifters, Maurice Williams and the Zodiacs — seemed to regularly change members. But no one cared if this was the “original” Drifters. We just wanted to get up on the roof or under the boardwalk. We wanted to be young, be foolish, be happy. We wanted to say to the security guards who accused us of climbing into and out of someone’s dank trunk, What kind of fool do you think I am? It’s a mystery to me now how these two lakes — one of them not much more than a pond — in the middle of the middle of nowhere, both within a half hour of my hometown, drew national talent night after summer night. There must have been money in it, despite the revenue lost to trunk and wood, but surely these bands could have made more in conventional dance clubs in Raleigh or Wilmington, Charlotte or Greensboro, places we small-town, rural kids thought of as big cities. I’m just happy these places existed, for even though I know one of them only by the aura it left in the memories of its patrons, if it was anything like the one I knew in my teens, it was magical. A sweet drive down back roads, past tobacco barns and head-high corn in field after field as the brutal summer sun finally cast shadows and brought shade. The thrill of entry, legitimate or not. The chance of meeting someone you did not know whom you’d like to get to know better. Most of all, the music, which — after a long day cropping tobacco or packing produce or, if you were lucky enough, basking in a plastic chair overlooking squealing kids splashing about in some swimming pool — took you to the place where music takes you, which has nothing to do with parking lots or ponds. Lovelorn lyrics, tight horn sections, thumpy bass, and chugging rhythm guitar — these sounds are what turn my time there into a field of dreams. Parker is the author of six novels, most recently All I Have in this World, and two collections of stories. His short fiction and nonfiction have appeared in various journals including the Washington Post, New York Times Magazine, Oxford American, Runner’s World and Men's Journal. His work has been anthologized in the Pushcart, New Stories from the South and O. Henry Prize Stories anthologies. A graduate of UNC-Chapel Hill and the University of Virginia, he is a Professor in the MFA Writing Program at the University of North Carolina at Greensboro.